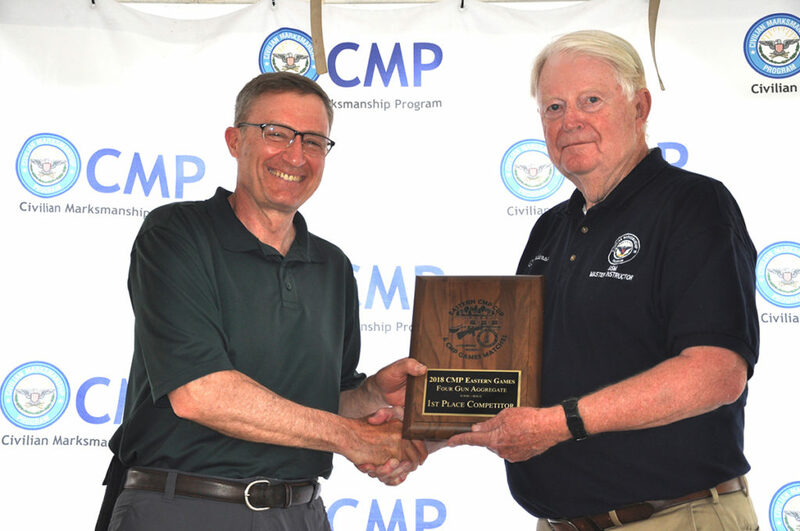 CAMP BUTNER, N.C. – During the hot and windy week of April 27 through May 5, competitors took the firing line at the Camp Butner Training Facility in North Carolina for the Civilian Marksmanship Program’s (CMP) Eastern Travel Games. 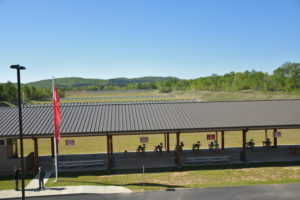 The event hosts a variety of rifle and pistol marksmanship competitions for competitors of all experience levels. 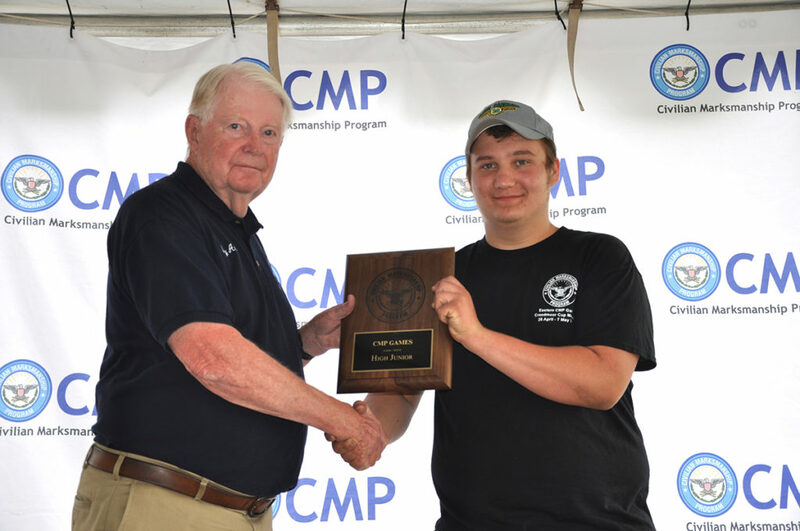 New this year, the CMP presented its prestigious Cup Matches, which tested the skills of some of the most talented athletes in the country. All rifle matches were fired upon CMP’s traveling electronic targets, which allowed for quicker completion times for the across-the-course matches, like the 80 Shot Aggregate and EIC Service Rifle matches, that see shot strings at the 200, 300 and 600 yard lines. 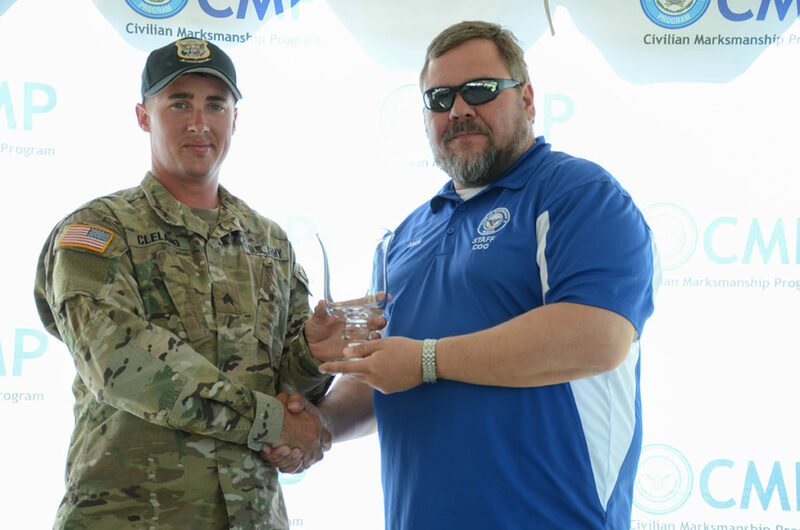 Winning overall in the 80 Shot Aggregate match was SGT Ben Cleland of the U.S. Army Marksmanship Unit. Three days of 80 Shot Aggregate matches produced daily high competitors in sitting, prone rapid and prone slow fire positions. 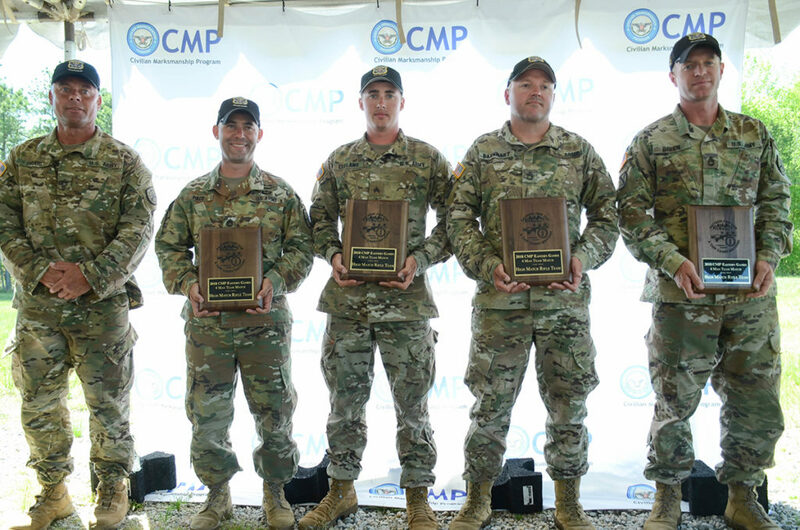 Topping the field with combined scores over the three days was SGT Ben Cleland, 25, of the U.S. Army Marksmanship Unit (USAMU), with a score of 2368-111x. SGT Cleland overtook the match by only two points. “I shot pretty well. It was a struggle, definitely, at some points, but I just tried to maintain throughout,” he said. SGT Cleland went on to say that the strong winds over the course of the three days presented huge challenges during the matches, but after making adjustments and sticking to them, he had his shots under control to carry him towards his win. “It’s a long aggregate, so whoever can tread water the longest, wins,” he joked. 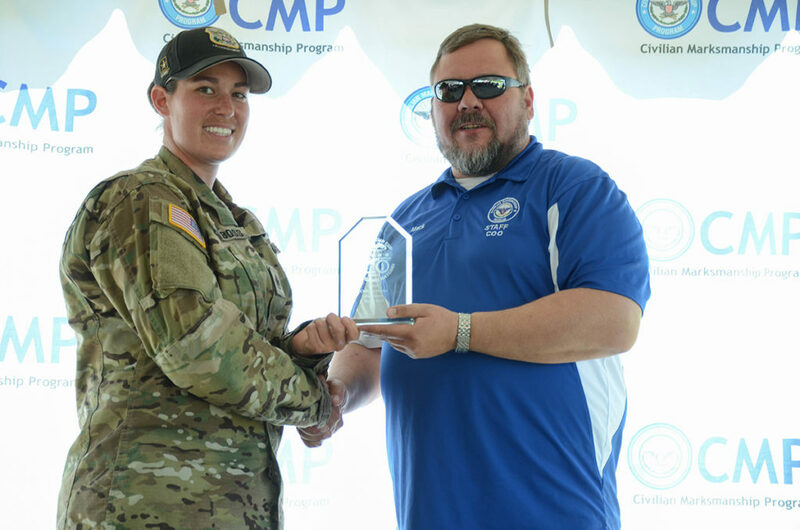 Teammate SSG Amanda Elsenboss, 29, of the USAMU, was the overall winner in the EIC Service Rifle Match, with a score of 495-24x. 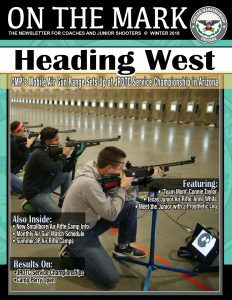 SSG Amanda Elsenboss bested the field in the EIC Service Rifle Match. Like Cleland, Elsenboss said she also struggled with the powerful winds during match days, but once she adjusted to the conditions, she held on and was rewarded with some enjoyable outcomes. 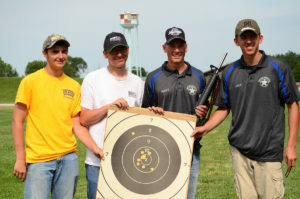 Elsenboss, along with other members of the USAMU, also served as a mentor during the Small Arms Firing School (SAFS) held during Eastern Games, which instructs developing marksmen on rifle fundamentals and the basics of competition shooting. The SAFS course is a combination of classroom education and hands-on instruction on the firing line. The class finishes out by participating in a true M16 rifle match, with the chance to earn EIC points towards a Distinguished Rifleman Badge. 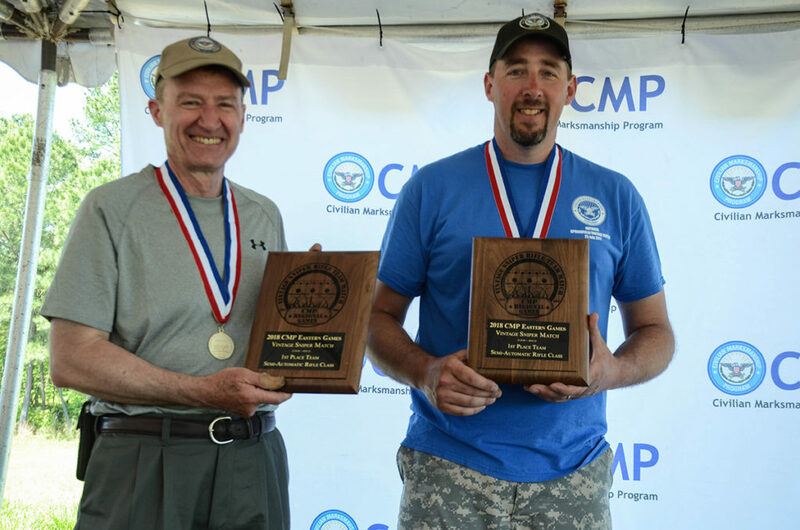 Coming back to again win overall in the M16 Match was last year’s winner, Richard Mast, 39, of Lynchburg, VA, who improved his score by more than 10 points with 388-10x. Earning her first four EIC points in the match and landing second overall behind Mast was junior Susie Krupp, 20, of Highland Lakes, NJ, with a score of 382-8x. After SAFS was over, SSG Elsenboss didn’t stop teaching, carrying her instruction into the more competitive matches and providing her guidance to others on the line around her. In the 4-Man Team event, Elsenboss (who shot a Personal Best in the match) helped her teammates of USAMU Peterson lead with an overall score of 1987-96x. Others who contributed to the win were SSG Joseph Peterson, SSG David Bahten and SGT Verne Conant. 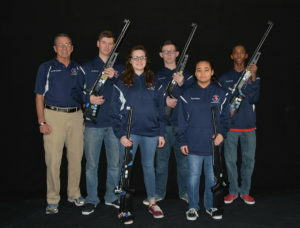 In addition to winning the Service Rifle category in the 4-Man Team event, the USAMU also overtook the Match Rifle portion. Members (R to L): SFC Brandon Green, SFC Shane Barnhart, SGT Ben Cleland, SFC William Pace, SGT Walter Craig. Christopher Roberts, 44, of Charlotte, NC, who fired a new As-Issued 1911 pistol score of 390-13x. 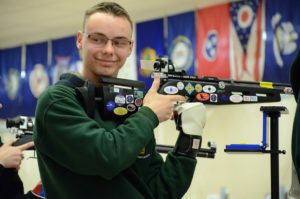 Stephen Walker was the High Junior of the Pistol EIC Match and fired a new record score. Stephen Walker, 18, of Mocksville, NC, who set a new High Junior record in with a .22 in the Pistol EIC Match with a score of 255-3x. 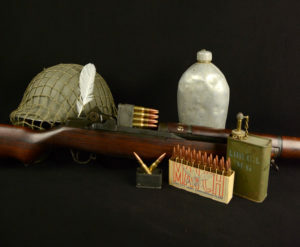 Brian Williams and Victor Betzold set a new Semi-Automatic rifle record during the Vintage Sniper Match. The Vintage Sniper Team of Brian Williams and Victor Betzold, who fired a new Semi-Automatic record of 376-8x. 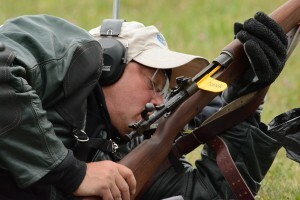 Leonard Lapato, 71, of Ephrata, PA, set a new High Grand Senior record in the Garand Match with a score of 283-8x. Additionally, Lapato set a new High Grand Senior record in the Modern Military event with a score of 280-3x. 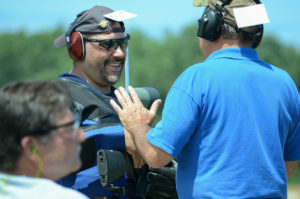 Keith Schachle, 59, of Brooks, GA, who fired a new overall record in the Modern Military event with a score of 294-11x. Alan Summers, 64, of Wilton Manors, FL, who set a new Commercial Carbine record of 354-4x. Danny Jackson, Sr., also set a new Grand Senior record in the Carbine event with a score of 343-2x. Dwayne Lewis, 52, of Greenville, SC, who set a new Unlimited Garand score of 293-11x. Thomas Gonda, 64, Erie, PA, who set a new High Senior record in the Tactical Class of the Rimfire Sporter event with a score of 533-11x. 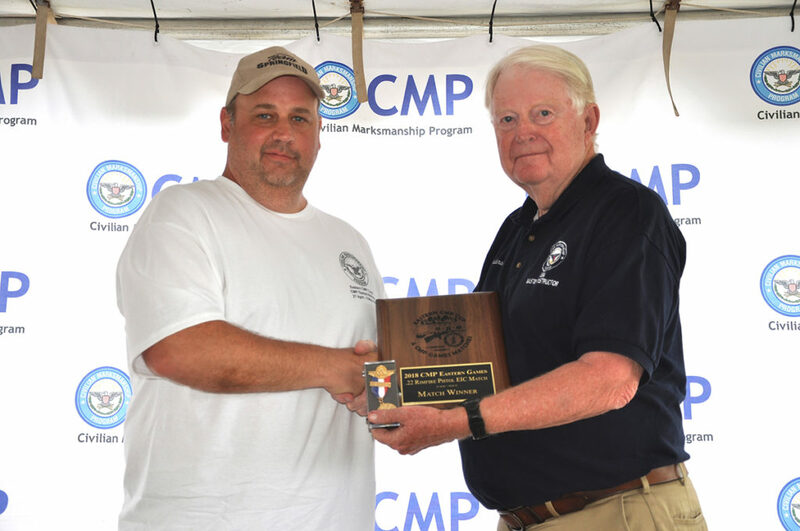 Christopher Roberts swept the pistol events and set a new As-Issued 1911 record score. Christopher Roberts, who swept all of the pistol matches, with overall wins in the As-Issued 1911 Match, Military & Police Service Pistol Match, 40 Shot Match, .22 Rimfire Pistol EIC Match, the Pistol EIC Match, along earning the Overall Individual Pistol Aggregate and the Service Pistol Aggregate titles. He and teammate Hiem Trang also topped the Pistol Team event by just one point. Victor Betzold overtook both the Three and Four Gun aggregate events. Victor Betzold, who claimed both the Three Gun and Four Gun Aggregate events. Betzold also claimed wins in the Garand Match course and the Carbine Match course. Keith Schachle, who won overall in the Springfield Match course and the Modern Military Match course. Roy Leidy, 55, of Northampton, PA, who led the Vintage Military Match course. 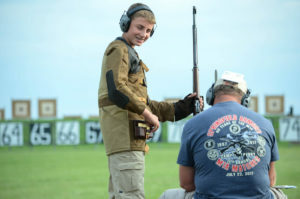 Ryan Ward, 21, of Greenville, NC, who led the O-Class during the Rimfire Sporter rifle event. Ward currently holds the O-Class Eastern Games overall record, which he set back in 2017, and the Eastern Class O-Class junior record that he set in 2016. Paul Snider, 48, of Salem, WV, led the T-Class with a score of 594-26x, while Nick Till, 44, of Howell, MI, overtook the Tactical Class with a score of 590-20x. The team of Paul Patel and Rick Thornley (Hard Leg 1), which overtook the Manual category of the Vintage Sniper event. 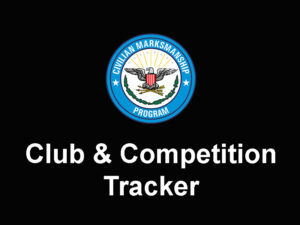 For a complete list of results, visit the CMP’s Competition Tracker page at https://ct.thecmp.org/app/v1/index.php?do=match&task=edit&match=16347&tab=results. Photos of each event can be found on the CMP’s Zenfolio page at http://cmp1.zenfolio.com/f429968721. I was in the Oregon Army Guard from 1980 - 1993 and was involved in competition for the last 8 or 9 years shooting on Oregon's Composite pistol, Combat Rifle and Combat pistol over those 9 years attending the Winston P. Wilson National Guard Small Arms Championship Matches at Camp Robinson., at LittleRock Ark. And then went to Regionals at Ft. Ord Ca 5 or 6 times after the Wilson Matches in those years and we went the Ft. Benning in 1987 for the All Army Matches for the Combat Rifle Team Match. This was the most exciting and rewarding experiences of my life. When I was finished I had 14 points in Rifle and Pistol towards the U.S. Army Distinguished Rifle and pistol Badges. After getting married in 1990 and having 4 kids I got out of the Guard in 1993 and turned my sights on Providing for my family and being very sad to walk away from the best times of my life while Competing in the Army's MARKMANSHIP Program. I'm very grateful for the privilege of having participating. It's 2018 now I'm 60yrs old and after almost 30years at my civilian occupation had to face early loss of work due to disability. Marksmanship in this program is something near and dear to my heart and now that I'm not working I have been dreaming of returning to the shooting field and of obtaining the highly coveted Double Distinguished Gold badges. 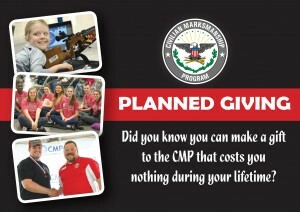 I am wanting to talk to anyone associated with the CMP to see if it is actually possible for me to find an avenue back to the games. It's this CMP that has got me thinking it just might actually be possible. If anyone reads this and could point me in the right direction I would be eternally indebted to them. In any event I want to thank the U.S. ARMY and the USAMU for the training and the years of great times with my fellow soldiers. GOD BLESS AMERICA AND THE US ARMY, AND LAST BUT NOT LEAST EVRYONE WHO HAS SERVED AND SACRIFICED FOR THIS GREATEST OF NATIONS. Glad to hear you'd like to participate again! You can contact Christina Roguski, [email protected] and she can assist you with updating your Dist. points. Also, contact Amy Cantu, [email protected], and she can help you with our new Accessible Distinguished Badges program.